Probably my coldest night so far. Wrapped in my sleeping bag, wearing basically everything I have (minus the rain gear and the gloves) and I still feel cold. The good thing with this cold nights though: they usually mean a clear sky. And sure enough, I set of under a blue morning sky. Only a few very high cirrus as decoration. Compared to the Deception Track, this one is fairly easy with only a few steep and muddy parts here and there. The track usually follows the river and only climbs away to avoid gorges and bluffs. 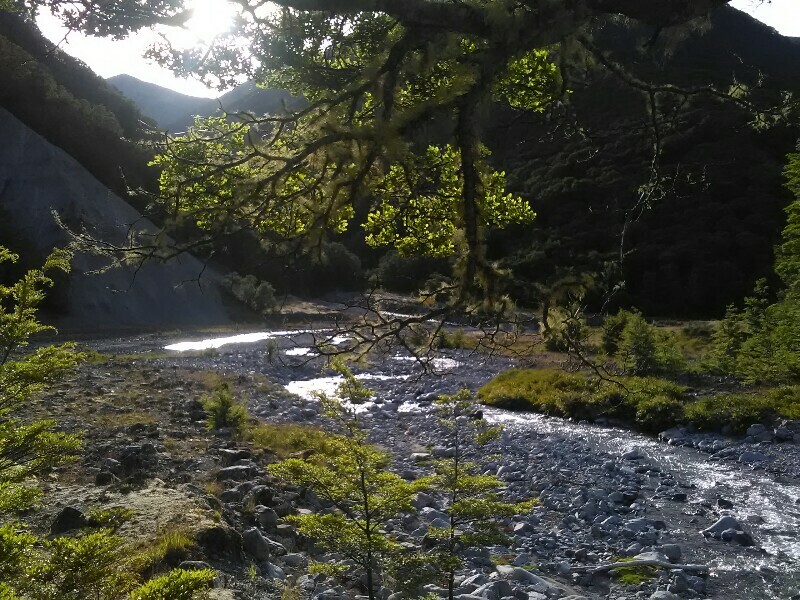 A few minutes before reaching West Harper Hut, I pass a great freedom camping spot right by the confluence of Harper River and Windy Creek (in case someone prefers camping). I make steady progress and earlier than anticipated I'm abeam Hamilton Hut, which is not directly on the trail. Soon after, the valley widens and I follow a 4WD track that crosses Harper River numerous times. Usually, the crossings are straightforward but I really wouldn't want to hike this section, if the river was up. I pass two Dutch hikers while they are putting their shows back on after a crossing. This would annoy me so much! With my Lunas I can splash right through without worrying about getting wet boots. The sandals dry within minutes, especially on such a sunny, warm day. To make the weather oerfect: A light northerly breeze has a pleasant cooling effect. The views and colors of the surrounding hills with the snowy mountains in the background are spectacular. After all these rainy, cloudy days without many views, I appreciate the views even more. Avoca River, the last river that I have to ford today, consists of around 5 different streams. Some of them small, some bigger. None of them difficult. Only the navigation through the shingle banks and scrub (very nasty one with lots of thorns) is a bit tricky. It takes me awhile until I reach the other side, as I somehow lost track of the markers (might as well be that there aren't any at all). A long, slightly annoying walk along a fence past a station follows, as the owners wouldn't let hikers walking on the much shorter and quicker 4WD track inside the fence. There are probably reasons for this but still... Why not just let hikers use it? Anyway, also this fence walk eventually ends and the last few kilometer are again on a gravel road. A family of four drives past me in their truck. Not the dad at the wheel, but his hardly 12 year old son. Makes me chuckle a little. But why not. Not many better places to learn to drive than on a nearly deserted gravel road. 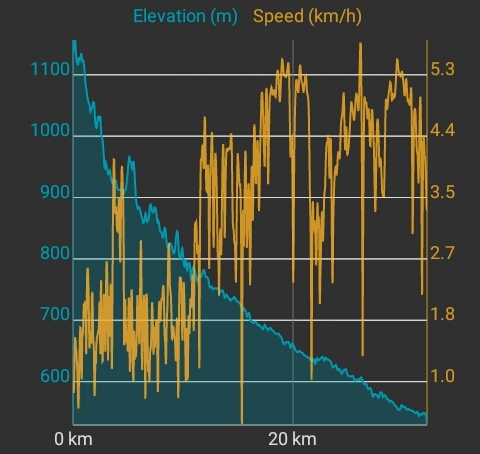 It's gotten very windy on the last few meter and pitching my tent at the free camping ground near Harper Village becomes a challenge. After a few attempts, everything is fixed and I can start planning for tomorrow. 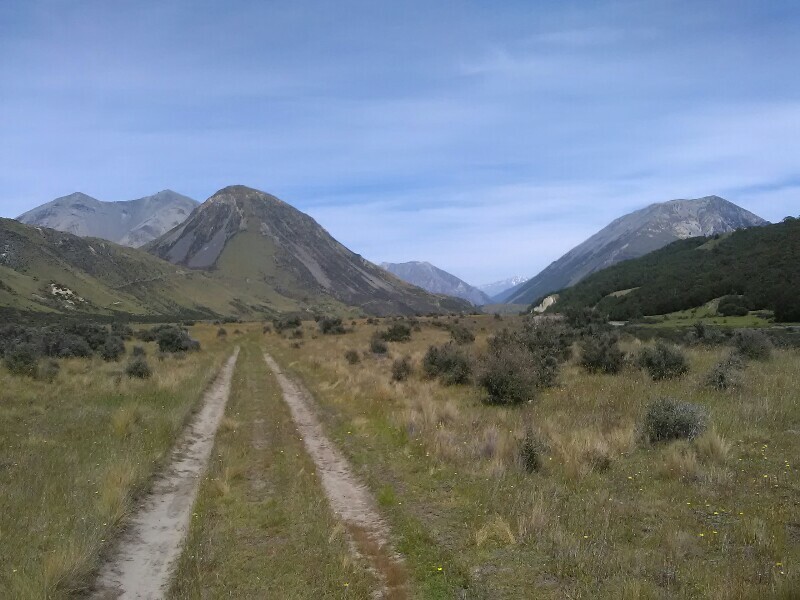 As usual, I will start early and hike to Lake Coleridge, located by the Rakaia River. 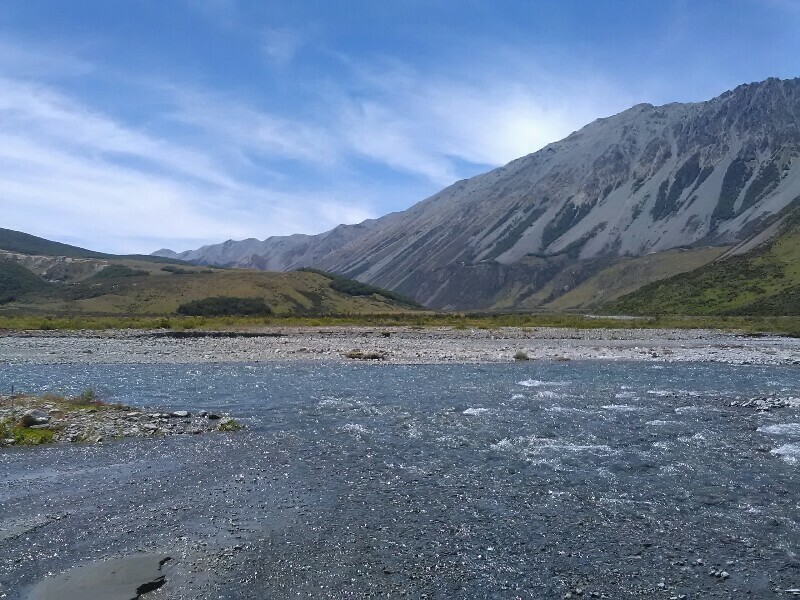 As mentioned in an earlier post: Rakaia River cannot be forded safely (it's therefore treated as a Hazard Zone and not part if the TAT). Thus I try to hitch a ride to Methven in the early afternoon, where I will resupply and spend the night, before hitchhiking up on the other side of Rakaia (if there will be any cars heading that direction...).